If you’ll recall my word for this year is “EXPLORE“! I feel like so far I’m doing more planning to explore than actually exploring, but I suppose it takes both! Although it wasn’t intended as one of my explorations, a recent even with my hair ended up being just that. I’m a short hair gal, have been for many years, after going from past-the-waist length tresses to cropped I’ve not looked back. The drawback for me having short hair is that it grows. FAST. Like, having it cut every three weeks fast. Sometimes the timing of having it cut vs. travel, special events and schedule doesn’t work out well at all. Cut it too early and it’s unruly when I need it to look great. Wait too long and the next cut comes at a time that doesn’t work in my plans. There are much worse problems in life but this is just the background to my adventure. It had gotten to the unruly stage but also would end up being unruly again at a time I needed it to look nice. What’s a gal to do? I’m too cheap to get it cut twice in two weeks. Since, on occasion, I had trimmed a bit off the edges and I routinely cut my husband & grandson’s hair (although that’s primarily with a “buzzer”) I got the inspiration that I could just do a little bit of trimming myself and then go in a week or so and let them sort out the mess, if I were to make one. (I bet I just made hair stylists everywhere cringe, didn’t I?) 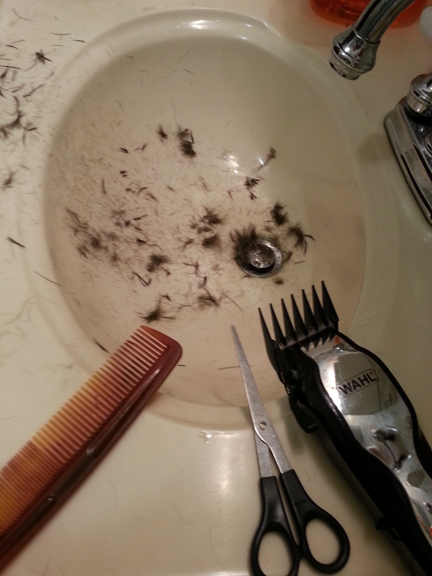 Out came the scissors, comb, trimmer and my “how bad could it possible end up” attitude. I trimmed the edges with a fair amount of success. (Although doing so “blind” in the back was a bit of a challenge, but I don’t see that part of my head anyway, right?) Well that brought up my confidence level a bit more so I thought I’d just snip around on the top & sides as well. So I snipped this direction and that, trying my best to imitate the stylists moves. Then I snipped a bit more here & there. Then I cleaned up a mount of hair that was forming on the sink, floor and all over my body (those capes are a great invention, aren’t they?). Enough. Well, maybe a bit more here & there. 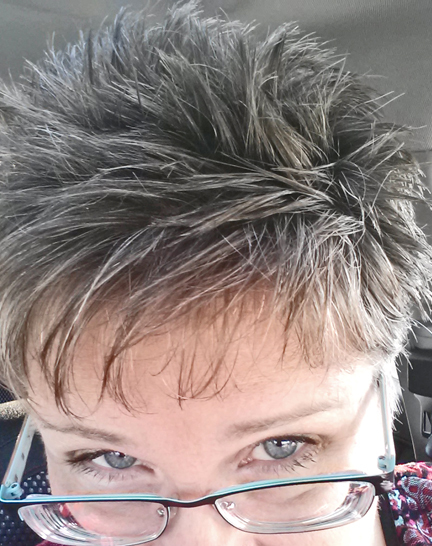 And, really, if I’ve gone this far I should probably trim up the top part of the back of my head. Blindly. Snip, snip, snip. More clean up. Hmmmm. Not quite even. Snip, snip, snip. Enough! No really STOP. So I finally did, cleaning up for the third time in the process. I bet your are expecting to hear how terrible it looked but, miraculously, it looks pretty dang good! Well, I can’t vouch for the back of my head but the rest I’m satisfied with and it will get me through for another week or so. Of course wearing a “messy” hairdo probably helped a lot! Now the next hurdle is getting it cut “proper” – I can only guess what my stylist will say but I’m thinking it’ll be something like “what happened to your hair?! ?” Shhhhh….don’t tell!